Net Neutrality? What is that anyway? And what can you do? > 111 Web Studio - by ICG Link, Inc.
Net Neutrality? What is that anyway? And what can you do? All of a sudden, my Netflix movies at home started "buffering" so I checked my bandwidth and discovered I had plenty... Hmmm... Then I called both Netflix and Comcast to complain. Netflix said, "Not us." But so did Comcast. I have the unfortunate advantage of being a tech nerd and it wasn't long before I figured out that Comcast was using something called QOS on their routers so my video streaming was a lower priority traffic than everything else. This went on for a month or so with me calling Comcast every time I wanted to watch a movie. 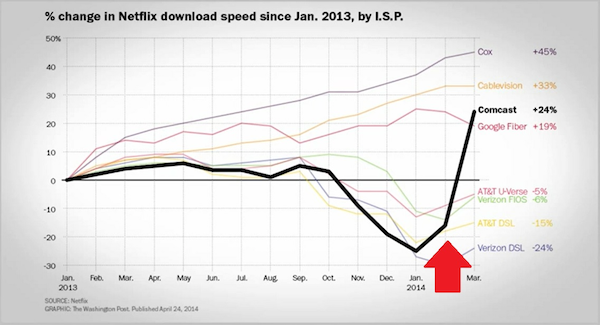 One day (red arrow), I saw in the Wall Street Journal that Netflix agreed to pay Comcast so they wouldn't degrade video streaming traffic. That night my movie streamed perfectly and it has done so ever since. This is what you can expect if the FCC gets their way with the new proposed rules against Net Neutrality. Content providers will be held hostage by ISPs like Comcast who will throttle their traffic unless the content providers pay up. This means your content will eventually become more expensive and startup content providers will never get off the ground. If these proposed rules had been in place, there would be no Facebook, no Twitter, no Netflix. The Internet as we know it will suffer. To make yourself heard, all you have to do is visit, FCC.gov/comments and find the proceeding with the title "Protecting and Promoting the Open Internet." Click the proceeding "14-28." You can also,try to click this direct link, but it might not work (government, you know). This is the FCC's Electronic Comment Filing System. Fill out the form and let them know what you think. If you have any questions about this or any other technical issues, please give 111 Web Studio a call at 877-397-7605 or contact us for more information.